Fourteen-year-old Michaela Higginbotham of Bolivar expected to learn about the history of Polk County 4-H when she began working on a national 4-H history project. But she was happy to uncover her own family’s rich 4-H tradition as well. She is one of Polk County 4-H members who helped gather and display 4-H memorabilia in the county’s museum as part of the National 4-H History Preservation Program. Cards stored in the county courthouse chronicle the projects her grandfather, uncles and cousins enjoyed while they were members. As a six year member of Woodlawn 4-H club, Higginbotham is following in her ancestor’s footsteps. She discovered a picture of her great-grandmother (who died before she was born) who was a Volunteer Leader, as is Michaela’s mother, a 10-year Polk County 4-H alumna currently leading her club’s bread project. She also unearthed a picture of her mother on the front page of a special 4-H section of the local newspaper. 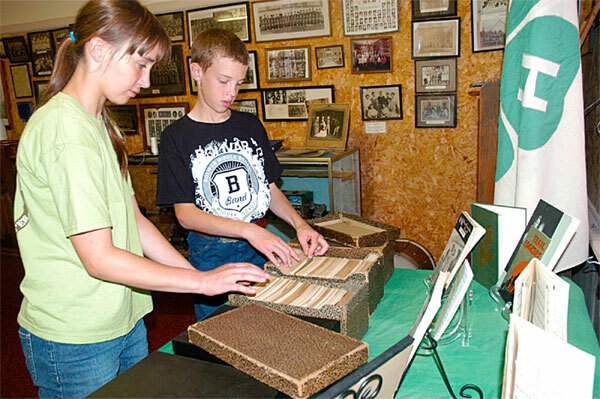 Polk County 4-H’ers Michaela Higginbotham and Jacob Toombs look over some of the 4-H memorabilia they helped collect for a display in the Polk County Museum in Bolivar, MO. Courthouse records also showed that the ancestors of 12-year-old Jacob Toombs of Bolivar participated in beef projects; one of the most dedicated volunteers on the history project, Jacob now shows Hereford cattle in 4-H.
University of Missouri Extension 4-H youth development specialist Velynda Cameron learned about the national “Voices of 4-H History” project at a previous 4-H FilmFest in Branson. Members were asked to make audio and video recordings of former members as part of the celebration of the 100th anniversary of the Smith-Lever Act, which created the national cooperative extension system. The Polk County Commission offered 4-H memorabilia found in courthouse storage, and a small, enthusiastic group of 4-H members expressed interest in having Polk County represented in the national project. They painstakingly pored through newspapers, microfilm and 4-H annual reports to gather information. Their research shows that Polk County 4-H club work began in 1926 with two garment-making clubs and 15 members. By 1928 there were 54 clubs in the county and 422 active members. Today there are 10 clubs and 186 members, Cameron said. The Bolivar Herald-Free Press published articles seeking memorabilia from former 4-H’ers, and current members began interviewing alumni from the 1940s, 1950s and 1960s. Items began pouring in, including an extensive collection from 84-year-old Betty Ammerman, who had kept a diary of her 4-H days. Museum curator Margaret Vest suggested the group put a display in the “school room” section of the Polk County Museum, since 4-H groups met at rural schools and teachers often led projects. Ammerman’s diary gives glimpses of the past such as “How to Cover and Make a Stool for a Dressing Table from a Nail Keg” in 1942. Polk County’s 4-H club is the first club in Missouri to participate in the “Voices of 4-H History” program, which aims to increase public awareness of 4-H by collecting and preserving audio, video and print information. Cameron encourages others with 4-H memorabilia to contact her at Cameronv@Missouri.edu.